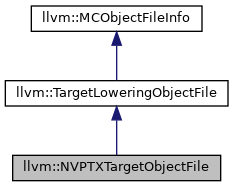 Definition at line 18 of file NVPTXTargetObjectFile.h. Definition at line 20 of file NVPTXTargetObjectFile.h. Definition at line 4898 of file NVPTXISelLowering.cpp. Targets should implement this method to assign a section to globals with an explicit section specfied. The implementation of this method can assume that GO->hasSection() is true. Definition at line 34 of file NVPTXTargetObjectFile.h. References llvm::MCObjectFileInfo::DataSection, SelectSectionForGlobal(), and llvm::SystemZISD::TM. Given a mergable constant with the specified size and relocation information, return a section that it should be placed in. Definition at line 28 of file NVPTXTargetObjectFile.h. Initialize - this method must be called before any actual lowering is done. This specifies the current context for codegen, and gives the lowering implementations a chance to set up their default sections. Definition at line 24 of file NVPTXTargetObjectFile.h. Definition at line 4900 of file NVPTXISelLowering.cpp.